I’ve been looking for my optimal off-site backup system for years now. I even spent some time building a cross-platform GUI wrapping rsync, with a view to offering a managed service bundled with storage like rsync.net (which I’ve also used happily before). The idea was to benefit from buying server space at scale, and lower the barrier to making backups this way. This might have been a worthwhile endeavour several years ago, but after seeing the progress of similar front ends and the plummeting cost of large scale cloud cold storage, I’ve now decided it’s not a great solo project! Other clouds are available, but up front AWS appeared to have the cheapest cold storage options out there, so that’s where I started. Somewhat confusingly, there are two only tangentially-related Amazon entities carrying this name – the standalone Glacier service, and the Glacier S3 storage class. I tried out a cross-platform desktop GUI app intending to use it for Glacier-the-service on macOS, before realising it only supported that mode on Windows. I also tried it with S3 using my own transition-to-Glacier lifecycle rules, but found it very unreliable. However by this point I was more or less sold on using the much more widely supported S3 protocol with some tool or other, and saving storage costs by transitioning to the Glacier storage class with rules I could configure and understand myself. This may cost more than Glacier-the-service, but it means wider compatibility and allows AWS’s versioning system to do its job, without building in extra layers of backup tool-specific abstraction for this purpose. After looking at a couple more tools I decided to try rclone, along with manually-configured Glacier transitions. So what do my backups actually look like? I’m sure there’s a nicer way to get this configured for all your buckets, but I did it manually in the UI for each one. This wasn’t one of the properties copied over if you use one bucket as a template for another. My main source of errors with rclone after getting the first sync right was from modification times being amended on files with no other changes. S3 won’t let you do that once an object has transitioned to Glacier class. In these cases I don’t care about mod times, so for me no-update-modtime was the perfect option. I trigger this with a terribly old-fashioned cron job with my email set in the MAILTO. And because it’s got quiet mode on, I get an email only if it hits an error. I also use flock to make sure the same job’s not running twice at once. After setting up all my jobs initially, I was a little surprised to receive a billing alert much, much sooner than expected, having set a limit which I thought I might approach towards the end of the month. Racking up a little over 2 million new backed up objects in my initial sync, this added $114 USD to my month’s costs – pretty much fully explaining the order of magnitude difference vs. my very rough cost estimate. I think the main take-away here is to start small if you don’t yet fully understand the costs of this stuff. For all that the big cloud providers like to diss each other’s pricing models, none of them are particularly simple and there is always a chance you’ll miss stuff! One point to keep in mind is that rclone’s GET requests to check the status of files actually make up about half the cost of my backups now, in a quiet month with few changes (the last of which cost me £9). So the frequency of your backups could make a real difference to the cost if you have a large number of files being checked, even if they change rarely. This is quite a big difference from a traditional rsync-to-server setup. But while it looks like the price variation will be greater, I’ve found a backup frequency that works for me and should prove much cheaper for my use on average. I’m looking forward to retiring my old backup server very soon! 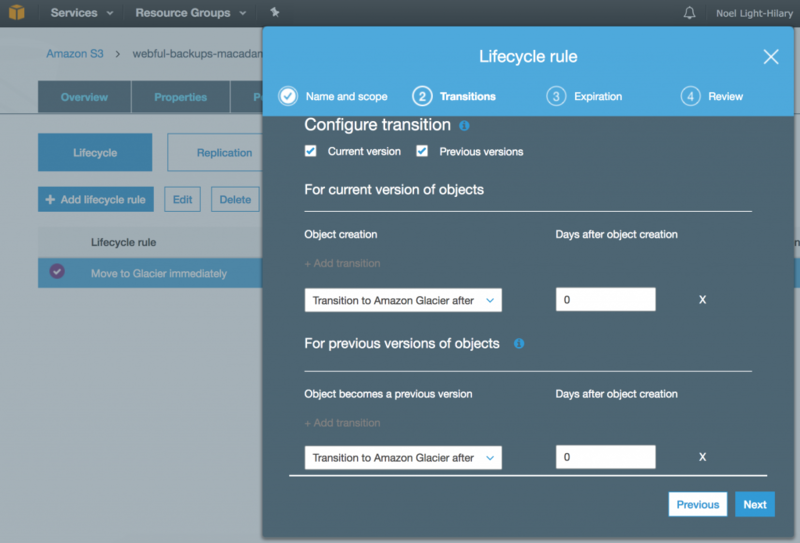 This entry was posted in Backups and tagged AWS, backups, Glacier, rclone, rsync, S3. Bookmark the permalink.